When the moon underwent an eclipse and turned blood red last January 31, a man from Luta told me that the old people have a saying : gai pilan. The prefix gai means "to have" and when joined to another word it modifies the first vowel in that word if the first vowel is an A, O or U. So when gai is joined to pulan, pulan becomes pilan. Gai pilan. There are at least three meanings of the word pulan. The first is the moon. That leads to the next meaning. A month is basically from new moon to new moon, so "month" is pulan. Even in English, the word "month" is connected to the word "moon." Finally, pulan can also mean "to watch over," as when someone watches over a baby, or guarding a house, or to watch over a sick person. We can only speculate why our ancestors used the word for "moon" for "watch over." Maybe it's because, in the darkness of night, the moon guides our path in the darkness when the moon's light is full. A woman's menstrual period. Even the English word menstrual is connected to the Latin word for "month" which is mensis. So when a woman is going through that time of the month (pulan), people can say of her gai pilan. When someone is mentally "off." All over the world, all across different time periods, people have associated mental illness with the moon. Many people believed in the moon's effect on people's moods, mental states, fertility and so on. The English words lunacy and lunatic come from the Latin word for "moon" or luna. Many mentally ill people were pictured staring or even howling at the moon. So, when someone is mentally "off," as perceived by others, people can say that the "off" person is gai pilan. Somehow the moon has affected that person's mental state. Pulan is found, in many variations, in dozens of other Austonesian languages, meaning "moon." In 1903, a good number of Sumay landowners sold land to the US Navy. 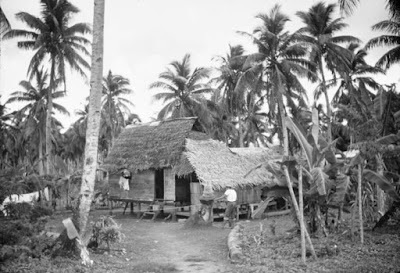 Sumay had been revived as a village sometime in the 1840s, perhaps even earlier, when whalers decided to anchor in Apra Harbor rather than at the old galleon trade port of Humåtak, which had ceased to be active when the galleons stopped coming to Guam because of Mexican independence from Spain in the 1810s. Even before the end of the galleon trade, Apra Harbor, more than Humåtak, was becoming the favored anchorage. The Spaniards were well-aware of Apra Harbor's military significance. Forts were built on Orote Peninsula in the 1700s and the most prominent one, Fort Santa Cruz, was built around 1801 right in the harbor itself, on an islet in the shallow part of the harbor. But the US Navy had bigger and more ambitious plans for Apra Harbor and the land surrounding it. Since Spanish times, the harbor was known as "San Luís de Apra" and even that was often misspelled by the Americans. These plans for military expansion in and around Apra Harbor meant the acquisition of land on the Orote Peninsula outside the village of Sumay. Federal money was allocated for the project, as seen in the 1903 newspaper clipping above. In 1903, the US Navy began buying land just south of Sumay village. The landowners were residents of Sumay and typically sold one to three hectares of land to the Navy. That's a good amount of land, considering that a typical modern house in the urbanized villages of Guam sit on less than an acre of land. One hectare is roughly equal to two and a half acres. 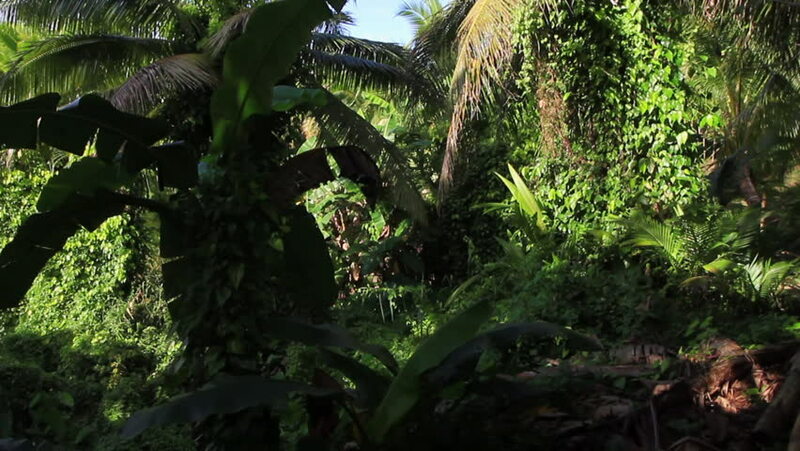 On Orote Peninsula, there were many specific areas with their own names, now long forgotten except for the older, former residents of Sumay who used to own land there and farm there. A story told to me by a 90-year-old man. Dies ham na mañe’lo. Guåho mås påtgon na mafañågo yo’ gi 1928 na såkkan. man maolek mo’na i dumångkulon-måme. sa’ pot gai defekto i lechen nanan-måme. Ti nahong sustånsia para u nina’ fan lå’la’ i famagu’on annai mañususu. ya ennao muna’ fan lå’la’ ham. Isabelo Francisco Guevara had a farm up in Ukkudu. In one field he grew suni (taro) and in another he grew kamute (sweet potato). December, January and February were not good months for his kamute. He noticed how damaged they were, so that he could expect no harvest of sweet potato that year. 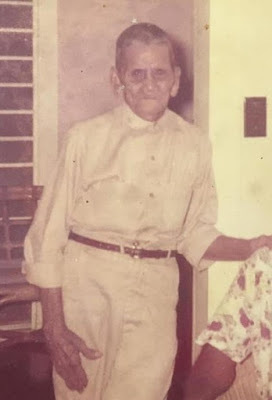 Not far from his farm was that of another man, José Iriarte, better known as "Boyok." 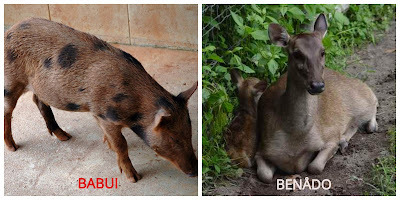 Boyok raised pigs and Guevara went to court, claiming that Boyok's pigs ran loose and damaged the kamute. Pigs are known for sticking their snouts into field plants and digging up what they think they can eat. Guevara : Your honor, Boyok's pigs are responsible for these damages to my crops. Boyok : Your honor, that is impossible because my pigs are always either tied or kept in a pen. Guevara : Your honor, I ask that you suspend this hearing until we can gather witnesses. Some are sick and the others live far away from the city in their ranches, so we need some time to call them. Judge : This hearing is in recess until witnesses can be gathered. Some days later, the court was reconvened and Guevara presented three witnesses, who all testified that they saw Boyok's pigs digging in Guevara's kamute field. Boyok presented one witness, named Joaquín Cruz. Cruz : Your honor, one night I was passing through Guevara's fields and saw benådo (deer) digging up the ground in Guevara's kamute field. There are many benådo in the wild and they come out at night. Guevara : Your honor, I question the impartiality of this witness, as he is related to the accused. Judge : This hearing is suspended until Joaquín Cruz Pérez and Ramón Borja de León Guerrero, Jueces de Sementeras (Agricultural Field Inspectors) can inspect Guevara's field and give us a report. Some days later, the two inspectors make their report. Judge : Let the record show that the field inspectors state that they inspected Guevara's field and have determined that there are signs of both deer and pig disturbance there. They also inspected Boyok's farm and found nine swine. Two were tied and the other seven were inside a pen. The inspectors also state that it is impossible to determine the value of loss in Guevara's field. The judge made a decision. Boyok's pigs were responsible for the damage and determined a fine that Boyok had to pay Guevara, to be substituted with other forms of payment in case Boyok did not have the cash. 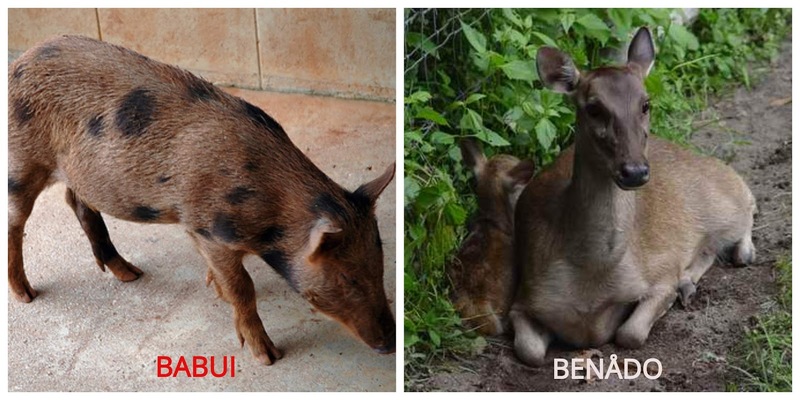 I suppose the testimony of three witnesses who claimed to see Boyok's pigs in the kamute field swayed the judge. What did mama buy over a hundred years ago? "Stores" as we know them today did not exist in the Marianas for most of the Spanish period which lasted around 230 years. 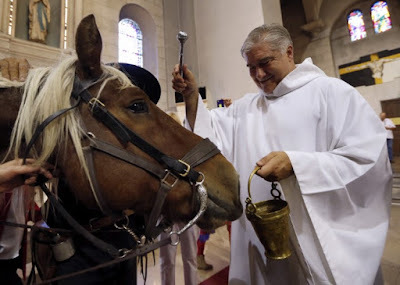 The missionary priests handed out many things in the beginning, and then the Spanish Governor controlled the sale of imported goods for many years after that. By the 1800s, though, more foreign ships were making trips to the Marianas for various reasons. Some of them brought things to sell. Towards the end of the 1800s, some individuals sold imported merchandise from their homes. Right as Spanish rule was ending, the Japanese expanded their commercial activity in the Marianas, opening small stores in Guam and Saipan. Under the US Navy, foreign and then Chamorro entrepreneurs established modern stores on Guam. The Northern Marianas became very active in commerce, almost all controlled by the Japanese. Fabric was one item always in demand in the Marianas. Our islands weren't able to supply the need for fabric. Spanish Governors, at times, even paid the soldiers and government clerks in fabric rather than in money. 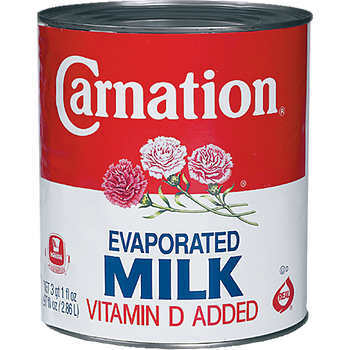 Caranclan. 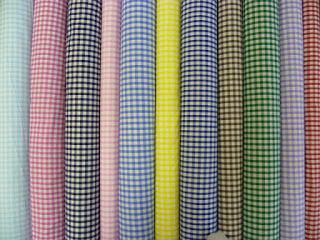 This fabric was known as gingham in English-speaking places. 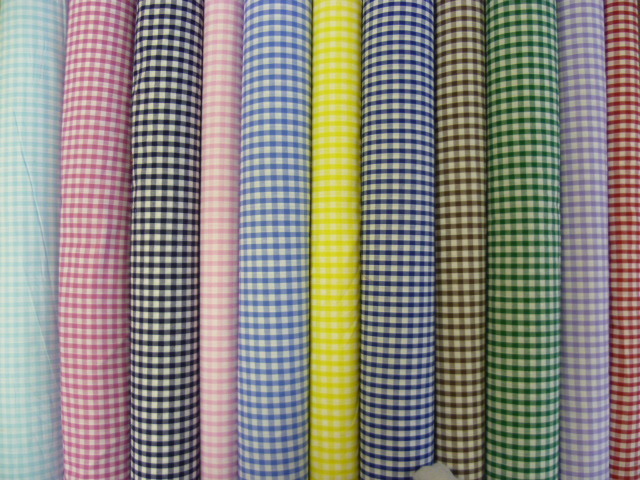 Gingham, or caranclan, was popular among the women who made their skirts with caranclan. 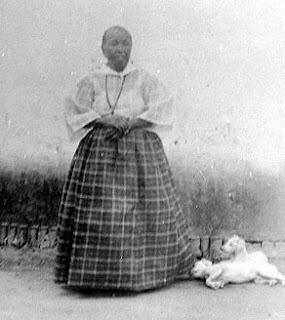 Look at this photo of a Chamorro woman wearing the mestiza dress using caranclan. Cambray. 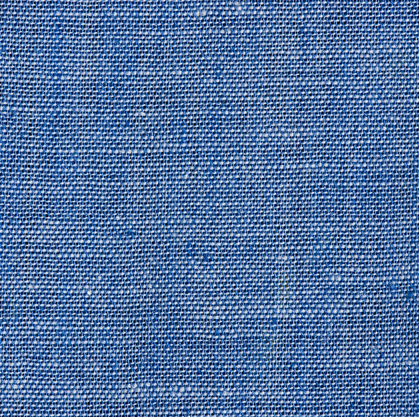 Among those who speak English, this fabric is called chambray. 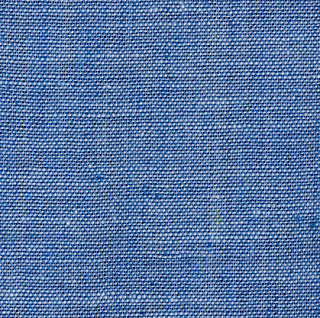 This was a thicker fabric, and would be used for trousers, for example. para u fanmanespia tinanom para åmot. Gotpe ha' do'do' si Chåro' ya magåhet na fotte i pao-ña. Ilek-ña si Chåro', "Ling. Seguro na guaha taotaomo'na guine gi uriya." Mamaisen si Ling, "Haftaimano tungo'-mo?" Manoppe si Chåro', "Adda' ti un nginginge' i pao-ña?" In Spanish times, after the end of the wars between the Chamorros and Spaniards, the population of Guam never exceeded 10,000 people. For many years, the population stood at 2000, 4000 or 6000. You can imagine how much idle land there was, besides silence, with such a small population. Just think of it this way; imagine if Talofofo, which numbers today around 3000 people, was the only village on Guam, and that those 3000 people in Talofofo had the entire island, from Merizo to Yigo, to work and play in! So one of the common features of island life in those days was the great availability of land for just about anyone. For sure, much land was claimed and legally owned. But much land was also unclaimed and lacked legal owners. Many land documents indicate land "with no known owner(s)." But it was also possible to acquire land simply by taking possession of it, without paying a dime. Just by occupying the land somehow, usually by doing some farming on it, you could become the legal owner, as long as no one else contested it. In the land document above, someone named José finally files a legal claim in court. He describes that he came into ownership of the land "por mera ocupación," in Spanish, meaning, "by mere occupation." This type of land acquisition is seen over and over again in the land documents of Guam. In time, many of these land owners formalized their ownership of the land. pues ha aposta si José salape'-ña gi ayo na kabåyo ya magåhet na mangånna! Pues ha li'e' si Påle' na ha bendise kabåyo numero sais. Ha aposta salape'-ña gi kabåyo numero sais ya mangånna ta'lo! Ha li'e' si Påle' na ha bendise kabåyo numero tres. lao ai sa' guiya na kabåyo i uttimo gi karera! lao guiya uttimo gi karera!" 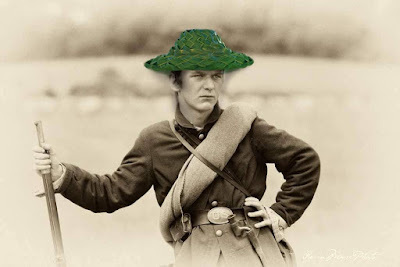 "Lahi-ho," ilek-ña si Påle'. "Ti hu bendise ayo na kabåyo na hu Såntos Oleos!" * Såntos Oleos literally means the "Holy Oils" and it is used in the Last Rites to spiritually prepare a person for death. Of course, it's just a joke. Priests do not give animals the Last Rites. Na' masi' na taotao sa' alunån-ña ha' siña ha toktok sa' pot taigue si kerida. Poor guy; he can only hug his pillow because sweetheart is not there. This is the Chamorro part of a song that also has a Carolinian part, sung by Dan Laniyo, a Carolinian from Saipan. gagaige ha' gi fondon kaohao-ho. kada hu atan nai nene ha na' suspiros yo'. sa' esta hu totoktok maolek alunån-ho. Esta. The original word is asta, from the Spanish hasta, meaning "until." The older people keep the original word more, while younger people tend to change asta to esta, which creates a bit of a problem because there is already a word esta, meaning "already." Esta guaha finiho "esta!" Prenda. A gift a lover gives to his or her sweetheart. A word borrowed from Spanish. Kaohao. 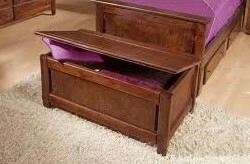 This is a chest to place special things. In the old days, almost every home had a kaohao where the woman of the house stored special fabrics, jewelry, important documents, photos and so on. Pega. This means "to place something," but I am rendering it "to hang something," as it makes better sense that way in English, although "to hang something" in Chamorro is kana'.